Introducing the 2015 chak Motors Molot! A completely new way to look at safety in the motorcycle world. The future of furniture is now availble for purchase! Our couches are hand crafted with carbon fiber by the same people that build parts for formula 1 and Moto GP. By using carbon fiber we were able to make our furniture incredibly strong and at the same time light. Our couches also feature all leather padding and a real gold lining on the edges. This is the highest hi tech luxury furniture any home needs. This is my most anticipated work of furniture that is now available for sale! Our Retro Alien Couch is made out of finest leather and to the highest quality you would expect from a luxury peace of furniture. It features an all fine leather pixelated retro design, a low profile, and memory foam cushions. A watch that can change faces with a push of a button. The Donkey Kong wall was a personal project, to commemorate my love for retro gaming. 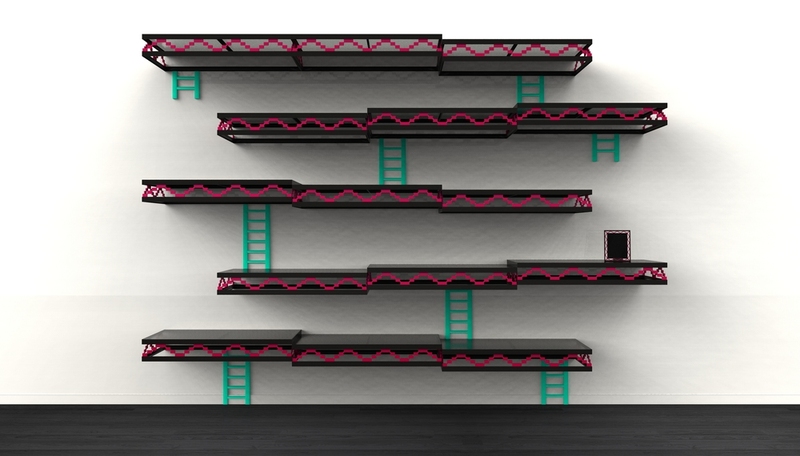 The shelves were inspired by the Donkey Kong steel beams. The wall is made out of individual sections; each section is made out of durable but light carbon fiber, anodized aluminum pixels that are joined with strong stainless steel rods and toughened glass tops. The special mounts themselves are made out of steel and can support up to 60 lbs. Surprisingly this project got a lot of attention and press around the world; this is one of the projects that I would really like to bring to reality someday. This is a 2015 Honda CB 750 a predecessor to the 70's-80's CB we all remember. It is reborn with state of the art Performance, handling, breaking and technology. The next generation of a smart bike, that knows its owner…literally. I would like to introduce you to an old friend that kept trying to take over earth but retired and became a couch.